Painting with sound on sonic canvas using broad and delicate brushes, creating an exhibition of sculpted sound around a musical well, Panopticon is a collection of expressive, evocative, soothing, playful, dark, exciting, often cinematic patches, also focussing on the granular capabilities of the hybrid monster named Avenger. The patches in Panopticon make use of re-synthesized/wave-tabled vocal, instrumental and electronic tones, processed field recordings, multi-sampled acoustic instruments like electric/acoustic guitar, soprano saxophone, accordion, singing bowls (also bowed), crystal bowls, wavetable-based drones, pads, sequencers and synths, granular/multi-sampled soundscapes, re-synthesized/wave-tabled hardware synths and more. Quite a few patches utilize the new cross-FM feature introduced in Avenger version 1.3, which allows for frequency modulation (FM) between oscillators. There is some overlap in the content folders for granular and sampling sources as Avenger converts a given sample/multi-sample either as a sampling source or as a granular source. 106 tagged patches (including 4 variations). 2+ GB (before lossless compression in Avenger) of original content (samples, granular sources, wavetables, shapes). 31 sample maps (multi-samples) and one-shots plus some samples embedded in the patches themselves. 16 single cycle waveforms (shapes). All patches have the modulation wheel, the three Macros and both Macro buttons assigned, many also use aftertouch and velocity to expressively shape the sound. Comes in the native avenger format, easy import/installation. Please note:In order to play the presets from this sound library you need to have Avenger version 1.3.3 or higher installed on your system. Please allow me a few hours to manually process your order and send you the confirmation e-mail. 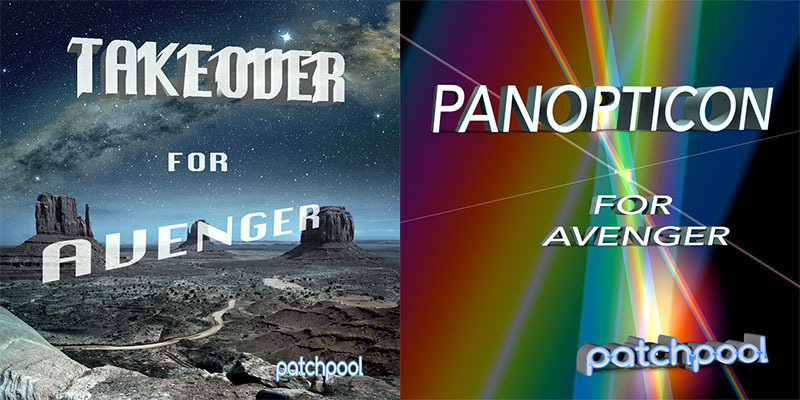 All demos were produced entirely with Avenger using only patches from Panopticon, no post-processing was applied apart from a limiter on the outputs and some volume automation, if several instances of Avenger were used in a track. Yeah, Drone From Mars, those are the kind of sounds I love. I'm into overtone singing and those splendid drone patches are the ideal sonic spaces I love to sing in. - Avenger user from the Switzerland (via e-mail, translated from German). Fantastic stuff, I'll get lost in this for weeks. - Avenger enthusiast from the US (via e-mail). - Avengerist from the Germany (on Youtube). This synth offers such a wealth of possibilities! Please allow me a few hours to manually process your pre-order and send you the confirmation e-mail.